Come Spring, the outdoors is a lot more fun. The world is greening up, pots are being filled with cool annuals and perennials. Join Susan at A Southern Daydreamer, for Outdoor Wednesday. It's fun to see what the outdoors is around the country. Last Wednesday, friend Sally and I headed north to my favorite garden store, Red Cedar Gardens just a mere hour away from Linderhof. Along with us was a pot for Sally and two pots for me -- it was Red Cedar's "Plant a Pot" class and we were eager to fill the pots with spring flowers under Ricki's expert guidance. My two pots were twins, cast iron pots that are in the herb gardens at Linderhof. And since the pots were twins, the plants had to be as well. In the center a lamb's ear. It is sometimes considered an herb and I love the fuzzy greyish green foiliage. On either side purply blue pansies. Not an herb but they are edible. And we love pansies at Linderhof. 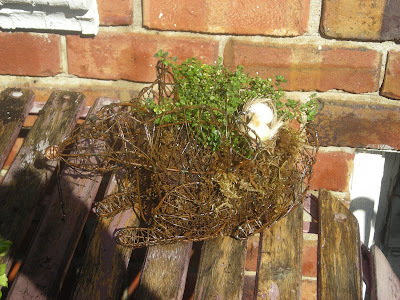 The outside of the pot was filled with two varieties of creeping thyme that should fall over the pot rim and a cascading oregano that should do the same. The pansies will be replaced come summer with marigolds -- again not herbs but definitely edible. 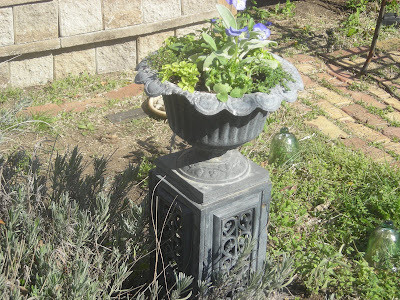 The pot, in place, in the herb garden -- surrounded by lavender and sage. And who can resist primroses? I would love to have a primrose path, but alas, the prairie gets too hot in July and August for primroses. These will grace my garden during spring and then come summer will be brought inside to "summer" and "winter" over in the breakfast room. A whim of a purchase is this rabbit topiary form. Planted with thyme and I think that it will be perfect in the "fountain of thyme" bed in the center of the herb garden. But first, it will be the centerpiece for a mother/daughter luncheon that I'm doing in May. I love watching Linderhof's garden green up. The daffodils are now gone but the tulips are abloom. Some of the lettuces are growing well in pots and soon we will have a lettuce harvest. Plans are being scribbled on napkins and newspapers as to plantings in these pots when the lettuces are gone. We've moved a few plants in the herb garden and can't wait until it's warm enough to plant the basil and tomatoes. We've got bags of daylilies to plant and hopefully will get that chore done this week. We've signed up for a couple of other classes at Red Cedar and can hardly wait for it is just a fun place to be! We love to be outside in the spring, planting and planning. It's nice to see bloom after the bareness of winter. Your herbs and flowers are beautiful. Love the rabbit topiary. My herbs are really starting to grow now that the weather is warming up. The sage is ready to bloom with beautiful purple flowers, and the chives are quickly filling out. I've taken photos, but haven't had time to post them. Thanks for adding me as a friend. I've added you to my blogroll and am looking forward to more of your posts. Hope all is well. I've been busy with sick little ones and with the Easter holiday haven't been able to make the rounds and post as much as I'd like! Anyway, beautiful pictures of your herb garden; I love that little rabbit topiary! Hurry up spring...we've been waiting such a long time here on the prairie!!! Yes I love being outside too, with that fresh spring air and so many wonderful flowers..
Hi there Martha...so good to see you again! I really like your urns...they are going to be gorgeous when they are all filled out!!!! Your urns are lovely! I have the light ones. They are a twin as well, but I haven't had the chance to use both. I'm working on it. Your sage is precious! That is one of my fave herbs! Love the rabbit! We have vegetables growing in our square foot garden and in every pot we could find. I didn't want to waste any of my seedlings! 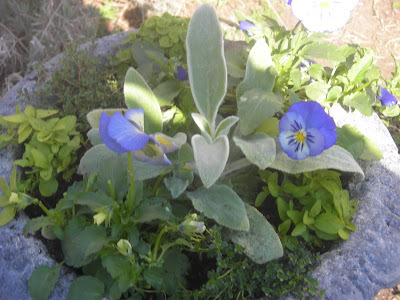 I love the gray lambsear with the violet pansies, just lovely! Your urns are so lovely and so unique. Love your post. I am glad you are seeing signs of spring. I can't wait to get out and start some gardening myself. Thank you for visiting my blog and I am add you to my blogroll. I love the urns! I also love primroses, but it gets too hot here for them also. I need to plant something soon. I've been slacking in that category!!! Can't wait to see you home surrounded in it's full glory of blossom and blooms. Hope you had a nice day filled with sunshine yesterday up here. The plants and birds sure love the sunshine. It's fun watching everything turn green and one day, it will be like a like switch was flicked on and suddenly all the trees will have there leaves again! Hi Martha, everything is so lovely....so springtime! I think I would have chosen the very same plants :) I think I saw the first pansies outside at the store yesterday so I'm anxious to get some pots planted also. I adore your little rabbit topiary! I love your urns... they are beautiful!!! The bunny is my favorite!!! Spring is the best!!! 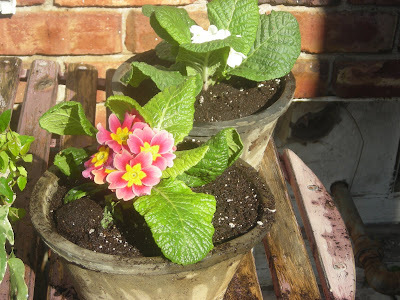 Plant a pot is such a great idea for a class. I would go to one. Your results are so sweet. It is too warm here for primrose, already but I did have quite a few. The gray lambsear and the violet pansies are lovely.